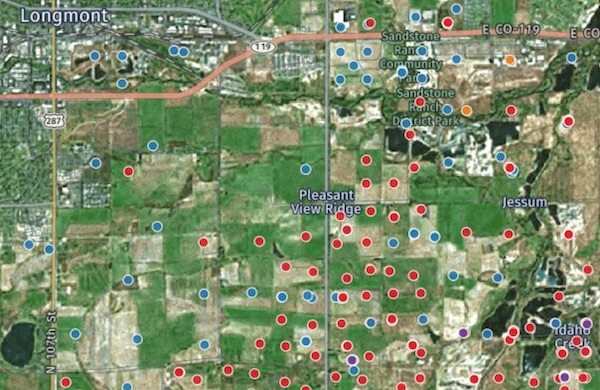 LITTERED: A recently compiled map shows locations of active oil and gas wells (in red) east of Longmont. Air quality measurements logged at the Boulder Reservoir in 2017 and 2018 place the Boulder area in the top five percent of the most polluted cities in the country for certain contaminants. Pointing to a graph of 28 major U.S. cities, Detlev Helmig, an associate research professor at the University of Colorado, revealed on Wednesday, Nov. 28, that the ethane measurements collected at the reservoir over an 18-month period would land that location as worst on the list, which includes Los Angeles, Detroit and Pittsburgh. Prof. Helmig explained that for scientists ethane is a valuable tracer, because it does not derive from many sources. “With ethane it’s pretty much clear that it comes from oil and gas,” he said. The results of the study, commissioned by Boulder County, provide direct evidence that fracking operations in Weld County are releasing high levels of Volatile Organic Compounds, including ethane, methane and benzene, which are then borne by the wind to other parts of the state. The bad news did not end there. Speaking to about 75 members of the general public at an event organized by the Longmont Public Forum at Front Range Community College, Helmig compared the progress made by other cities in combatting ozone pollution with the deterioration found in the Boulder area. Measurements conducted by the Colorado Department of Public Health and the Environment at the Boulder Reservoir during the recent summer months showed that ozone levels exceeded the U.S. standard of 70 ppb (parts per billion) on many days. Prof. Helmig warned that Boulder and several other Colorado counties are likely to “get bumped up” from moderate to serious non-attainment of the EPA’s ozone standard. He emphasized that the situation in the Northern Colorado Front Range is the exception rather than the rule. “Ninety percent of the US doesn’t exceed the ozone standard,” he said. On this measure too, the Boulder area now falls in the most polluted five percent of the country. Worryingly, the EPA standard may be too lenient; in Canada it is 50 ppb. Ozone is produced through a secondary reaction of Volatile Organic Compounds and nitrogen oxides, particularly on sunny days. Ozone is known to cause respiratory diseases, such as asthma, and chest pain upon deep inhalation, for example when exercising. It can be lethal. A study by scientists at the University of York in the UK published in 2017 linked one million premature deaths per year globally to long-term exposure to ozone air pollution. 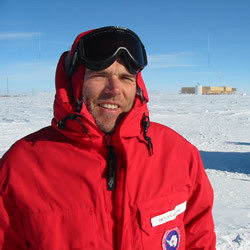 A major challenge Prof. Helmig faced, together with other researchers from the Institute of Arctic and Alpine Research at CU, was identifying the source of pollutants measured at the Air Monitoring Shelter at the Boulder Reservoir. Using what he calls “top-notch analytical equipment,” the team recorded around-the-clock measurements of nitrogen oxides and Volatile Organic Compounds. Perusing weather maps showing wind directions, the scientists were able to trace the pollutants back to Weld County. One of the most striking finds was that on days the wind blew from the West, the level of Volatile Organic Compounds was low. On days when the wind blew from the Northeast, the level of these compounds was high. Data analysis indicated that eighty percent of total Volatile Organic Compounds recorded at the Boulder Reservoir came from oil and gas sources. Extrapolating from the numbers obtained, Prof. Helmig estimates that, for benzene alone, 400 tons of this hydrocarbon, equivalent to 20 oil tankers, were released by the oil and gas industry into the air of Northern Colorado last year. It is important to recognize that scientists do not know what a safe distance is for airborne emissions from fracking. The population of the Front Range is essentially the subject of a large-scale experiment. In November, Colorado voters defeated Proposition 112, which would have increased fracking setbacks from inhabited structures to 2,500 feet. The oil and gas industry spent $40 million on this campaign, while the grassroots nonprofit supporting Prop. 112, Colorado Rising, spent a mere $1 million dollars. It now remains to be seen whether Democratic legislators, in full control of the State House, Senate and governorship, will take action to protect the health of residents of the Front Range. Boulder County covered the costs of the first 18 months of the air-monitoring project as part of its ongoing efforts to determine the impacts of fracking on the health of its residents. Meanwhile, Crestone is trying to move the permitting forward through the Colorado Oil and Gas Conservation Commission, prior to a decision in the court case. If the court allows the drilling to proceed, Longmont, Gunbarrel, Niwot and Erie residents all stand to be impacted. There are currently more than 50,000 active wells in Colorado. Funding of the monitoring station at the Boulder Reservoir is currently provided by the nonprofit organization Earthworks. Prof. Helmig emphasized that research into air pollution – with the exception of ozone – and into the health impacts of oil and gas “is not funded well.” The lack of solid monitoring data has made it harder to counteract claims made by the oil and gas industry. The Longmont Public Forum will host a presentation on the health effects of fracking in the Longmont Public Library, at 4th Ave. and Kimbark St., on Jan. 23, 6:30 to 8:30 pm. killed his whole family in August of this year ; killed pregnant wife and two young children and worked for years on the Anadarko oil sites and his two kids suffered from asthma. can exposure to chemicals screw up the brain and judgement so much that someone becomes a murderer and how are the asthma rates in these fracked counties ? Wow, very insightful and sobering article. Thank you! Is there any protection from this pollution to living at higher elevations in the foothills? In a study conducted over the summer of 2014, Prof. Helmig and his team compared ethane levels at several sites in Boulder County, from the mountains to a park in East Longmont. The relevant graph can be found in Helmig’s presentation to the National Center for Atmospheric Research, around minute 10: https://www.youtube.com/watch?v=j3oTf-2K99A . You will see that the ethane concentrations are lowest in the mountains and increase dramatically as you head east. Ethane, Helmig points out, is the second most abundant hydrocarbon in natural gas. In the next slide, you will see a similar pattern for other petrochemicals, including propane and isobutane. To answer your question, Jonah, it appears that living at higher elevations to the west of Boulder does provide some protection. Bear in mind that the study was conducted in 2014, when fracking activity was less intense along the Front Range. More recent maps produced by Helmig do show that the situation gets worse as you head east, i.e. towards Longmont, and he confirmed this in his presentation at Front Range Community College. Thank you for sharing this extremely important information on the air quality of the Boulder County area. This is disheartening to think that this situation will probably get worse since the big oil companies exist on making more money with absolutely no concern for the health of all who live in this area!! Its a tragic situation. After moving and retiring here my husband and I are now considering moving far from this destructive and dangerous state !! And yet we just voted down Prop #112. It boggles the mind. The west wind is the prevailing wind here. It would be helpful to know how many days the wind blows from the northeast instead of from the west, or at least how many of the study days had such winds. Thank you for asking this question, DaisysMom! Arlington TX allows wells 300 feet from its residents…yup we’re fracked too. Amount of Fracking happening around us! in Response to Ms Scroggins, there is currently no scientific link to intellectual degradation due to fracking chemicals, but science has proven that rates of domestic and sexual violence against women as well as drug trafficking increase in direct correlation to the advent of the oil and gas industry moving into new territory. The speculation being that the unstable nature of a boom bust job attracts a certain type of employee with poor impulse control which is magnified by the grueling round the clock schedule and the drugs (typically meth) which many resort to using to keep up the pace. Jessica LeRoux. You raise an interesting point that has implications beyond the oil and gas industry. If true, this should also apply to the Rocky Mountain mining camps of the 19th century (with other substances, of course. taking the place of meth). I wonder if research into mining camps has uncovered of similar behavior of the residents. Excellent article! Thanks for doing this. One shortcoming though is that I can’t find a link to the actual study. I did some digging and this might be the study: http://doi.org/10.1525/elementa.300 if not it’s certainly worth looking at for us Coloradans who are concerned about our air quality. I do appreciate that you referenced other older studies. Lot’s of other interesting studies that analyze how contaminated out local environment is. I live in eastern Longmont, near Union Reservoir. Recently I have been smelling a lingering chemical tinged smell on the breeze, when it comes from the Northeast and East. This is disturbing to say the least. The issue of toxins in our air needs to be resolved and I will make sure to spread this information to all I connect with. I respect the right of any citizen to show up at fracking sites armed to the teeth to stop fracking near their home. Clearly the ballot is not effective when Oil and Gas can spend millions to distort reality and fool people into believing they have their interests in mind. I just moved to Boulder from Brighton Colorado….thinking I was getting away from the poisoning fracking fumes my whole family inhaled for years. Tonight, 2-25-2019 the air is foggy here in Boulder and fracking fumes linger so bad my lips and nose are burning, just as they did when I lived in Brighton. Something is going on and we need to do something.